The Honourable Robert French AC was formally installed as the 15th Chancellor of UWA on February 1, taking up the mantle from Dr Michael Chaney AO. The former Chief Justice of Australia’s High Court and one of the country’s most respected judges is no stranger to the University. He was one of a cohort of students from the 1960s who went on to become national figures in politics, justice, economics and foreign affairs, and has lectured in constitutional law. He’s also served as part-time Commissioner of the Australian Law Reform Commission, Judge of the Supreme Court of Fiji, President of the National Native Title Tribunal, and council member of the Australian Institute of Judicial Administration, among many other roles. When Uniview caught up with him just two weeks into a busy schedule of campus meetings, the man who won a State public speaking competition at 16 and has been described in the media as one ‘who thinks deeply about the law and its place in society’ was in a relaxed mood. “I love Perth,” he said, reflecting on the place he has always called home. One of the nicest things about becoming Chancellor has been the opportunity to reconnect with the local community. My connection had become fragmented during the time I was Chief Justice and living between here and Canberra. While it’s too early to comment on his plans for the role, Mr French said his first priority was to develop an understanding of what’s going on and to meet with people from across the institution, so as to “have a clear enough vision to take part intelligently in debates about its future direction”. Along with an understanding of the complex legal, funding and policy frameworks in which UWA operates, he said an excellent working relationship the Senate, the Vice-Chancellor, the Executive and all of the University’s working components was paramount. He’s certainly well-qualified for all of the above. Described by past president of the WA Bar Association Ken Martin SC as a “legend in the law”, Robert French first completed a science degree (majoring in physics) at UWA in 1968 before switching to law the following year. “I was going to be a great theoretical physicist but in third year the Dean of Science said to me, after I presented at a seminar, ‘You express yourself magnificently but I’m not sure you know what you’re talking about.’ So I decided to be a lawyer! 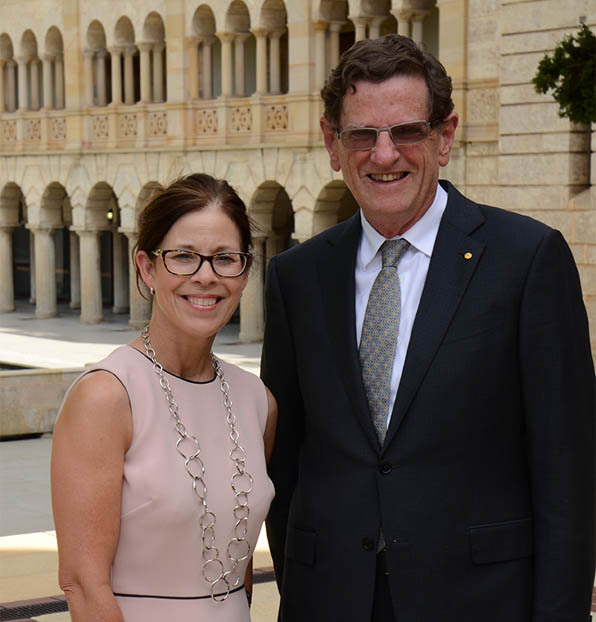 UWA Vice-Chancellor Dawn Freshwater with new Chancellor Robert French. ”He tells of turning up to his first law lecture fully gowned, not realising the policy that demanded law students wear academic gowns had been abolished. “That was interesting, but I didn’t let it turn me off.” Heavily involved in campus life, he was President of the University Liberal Club and, for a while, Guild Treasurer. “I think the experience I had on campus – not just the formal studies but the array of activities in which it was possible to engage – the debating, the student politics, the societies, organising things – all helped in developing experience and some embryonic skills that stayed with me later on in life. ”As well as being active in the student union movement, he was one of the first two students elected to the UWA Senate, and an organiser of the first Guild peace march during the Vietnam War and anti-apartheid protests against the touring South African rugby union team in 1972. Firm friendships were made that still endure today. There’s no surprise when Kim Beazley wanders in during our interview for a chat. While a few years apart at UWA and on opposing political sides, the two became close friends, along with Bob Pearce and Jim McGinty, who would go on to be State ministers, and former WA Premier Geoff Gallop. Another UWA law student, Valerie Lumsden, who was later a barrister, judge, magistrate and the first woman to sign the WA Bar Roll in 1975, would become Robert French’s wife. The couple have three sons, two of whom are lawyers and one – “the wild-card” – a chartered accountant. They also now have twin grand-daughters. After admitting to “trying marathon running during a mid-life crisis”, the new Chancellor now enjoys walking, swimming and tennis during his rare moments of downtime, and this year greatly enjoyed outings to the Perth Festival, the popular ‘event for the people’ founded by UWA in 1953. He said he’s always been struck by the impact the University has had on the community, citing as another example a story from when he was standing for the seat of Fremantle (against Kim Beazley Senior) in 1969, and met fellow Liberal and former PoW Iole Burkitt (née Harper). “Iole was one of the nurses imprisoned by the Japanese in Sumatra during World War II (later featured in the book White Coolies by Betty Jeffrey) and was chair of a local branch of the Liberal Party,” he explained.“In ’69, she and a number of her friends had been to a UWA Summer School called 'A new era for Aborigines' and as a result they started a lobby group, the New Era Aboriginal Fellowship, to address Indigenous disadvantage across a range of areas. “I became interested in it, along with a number of other people, and formed a justice committee which ultimately became the Aboriginal Legal Service (ALS) of WA. Someone else started a medical committee which became the Aboriginal Medical Service. The impulse for all of this was from one UWA Summer School. ”He has maintained a strong interest in Aboriginal affairs, speaking publicly about the “appalling” rates of Aboriginal incarceration and supporting constitutional recognition of Indigenous Australians. Outgoing Chancellor Dr Michael Chaney said it’s “this humanity and ability to connect with people on all levels and from all walks of life”, as well as his career and academic achievements that made Mr French “a stand-out choice” to become UWA’s 15th Chancellor.